Note: Live births with a birth weight less than 2,500 grams, expressed as a percentage of all live births (birth weight known). 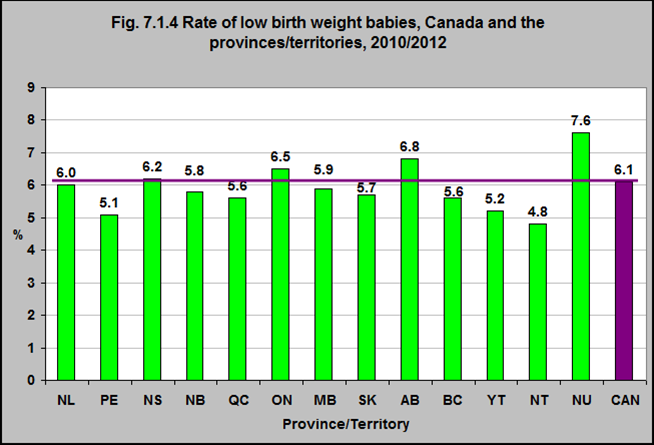 In 2010/12, the low birth weight (less than 2,500 grams) varied between provinces and territories. It was 7.6% in Nunavut, 5.1% in Prince Edward Island and 4.8% in the Northwest Territories, compared to the national average of 6.1%. Babies who are born with low birth weight are born either at term or before term. Because they are not a homogeneous group, risk of their physical and developmental health problems varies. The majority of low birth weight babies have normal outcomes, however, as a group they have higher incidences of below average growth, illnesses and neurodevelopmental problems, such as cognitive, attention and neuromotor functioning. These problems persist into adolescence. Those babies with the lowest birth weight have the highest risks. Low birth weight babies who live with socioeconomic/demographic risk have a higher likelihood of having cognitive problems that persist as the child grows. Programs that provide interventions and enrichment for these children help optimize their development.2 Therefore, it is important that the provinces/territories have such programs to support these infants and children. 2Hack M, Klein NK and Taylor HG. Long-term developmental outcomes of low birth weight infants. Future Child. 1995 Spring;5(1):176-96. https://www.ncbi.nlm.nih.gov/pubmed/7543353 -accessed August 31, 2017.